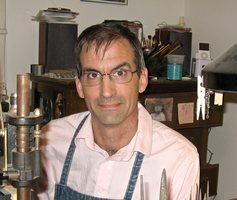 Tom McCarthy has been making jewelry for over thirty years. He has an MFA from Southern Illinois University-Carbondale. His work is in numerous private and public collections including the Mint Museum of Craft and Design in Charlotte, NC. McCarthy has often taught at Penland, Arrowmont School of Arts and Crafts and the Campbell Folk School. He contributed a chapter to The Penland book of Jewelry, Lark Books. The State of Florida awarded him a Fellowship in the Arts in 2006. I like to make stuff. Specifically I like to make stuff for people to wear. Jewelry fascinates me. What people wear, how they wear it, what I can make wearable and how I can make it are the kinds of things that daily occupy my attention. Based in traditional craft ethos, my work is an exploration of material and form. This investigation is ultimately about beauty and the interplay between object and wearer.